AARON MATÉ: It’s The Real News. I’m Aaron Maté. The hopes for de-escalating tensions and possibly, one day, reunification on the Korean Peninsula were raised this week with an act of teamwork. North and South Korea announced they will march together under a single, unified flag at the upcoming Winter Olympics in Pyeongchang, South Korea. They will also field the single women’s ice hockey team with players from both North and South. Now, this teamwork contrasts with a different kind of grouping that was going on thousands of miles away. In Vancouver, Canada, the US and Canadian governments held a summit aimed at winning support for increased pressure on North Korea, including even a naval blockade. But this summit was met by another gathering. 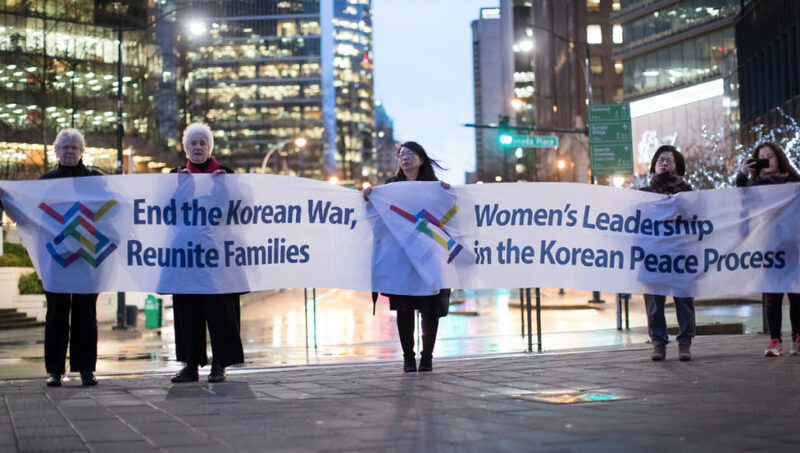 At the Vancouver Women’s Forum, women peace activists came together to protest the summit and call for a diplomatic solution on the Korean Peninsula. Joining me is Christine Ahn, founder and coordinator of Women Cross DMZ and an organizer of The Vancouver Women’s Forum. Christine, welcome. Let’s start first with this news of North and South Korea in this display of Olympic unity next month. What does that mean? CHRISTINE AHN: Thanks so much, Aaron. It’s extraordinarily heartening and probably the most important single action that would avert a war on the Korean Peninsula that is being potentially waged by the Trump administration. As you may know, in the New Year’s address, Kim Jong-un, the leader of North Korea, basically in his New Year’s speech, extended an olive branch where he offered to send North Korean athletes to the South Korean Pyeongchang Winter Olympics. South Korean Moon Jae-in, he quickly seized that window of opportunity, and he quickly responded. And on January 9th they had the first high-level talks in over two years. At that meeting, they agreed to de-escalate tensions, including re-establishing the military-to-military hotline that had been shut off. They agreed to the Olympics, sharing of the sending of the athletes and marching together under the one Korea flag, and also to just continue this dialogue. They had a second meeting just this last week, and that’s when this other really great news emerged about having South Korean athletes train in North Korea at the ski resort, and a joint women’s hockey team. And of course, the incredibly symbolic marching in the opening ceremony at the Winter Olympics under a one Korea flag. It is the best news that has been coming from the Korean Peninsula in some time. AARON MATÉ: Christine, meanwhile, as this show of Olympic unity was unfolding, you had this summit in Vancouver organized by Canada and the US. You went there with a group of women peace activists. What was your message? CHRISTINE AHN: Well, we convened a delegation of 16 women representing peace movements from across Asia, South Korea, Japan, from the Pacific, from Guam, from Sweden, from across the United States, from across Canada. It was cosponsored by five major organizations: Women Cross DMZ, The Nobel Women’s Initiative, Women’s International League for Peace and Freedom, Canadian Voice of Women for Peace and The United Church of Canada. So, it was really a meeting of movements led by women because we know that when women are at the table, there is a greater chance of there being a peace agreement. I mean, if you look at studies of the last 30 years, I mean, of the 40 major conflicts, when women were involved, 39 led to a peace agreement. In fact, when women are at the table, in terms of helping to draft that agreement, it’s more durable, so, the evidence is in. We had heard that Canada, Prime Minister Trudeau had expressed last winter that if the US and the Trump administration were not willing to engage with North Korea, that Canada would be willing to step into that vacuum, and that he had hinted that he had been having conversations with Raúl Castro because Cuba has good diplomatic relations with North Korea. We know the role that Canada played in the back channel negotiations between the US and Cuba that led to the normalization which, as we know, has been basically jeopardized by the Trump administration. But we do know that they can play an honest broker role. The announcement that they were co-convening this Vancouver summit with the US also fell on the heels of the National Action Plan by the Canadian government. It was signed by five ministers across different cabinets saying that women must be at the table, and so we thought this would be a golden opportunity for us to gather, to try to press upon the countries that were convening the foreign ministers, and to really let them know that their approach of maximum pressure, which really is more sanctions and cutting off diplomatic ties with North Korea isn’t going to achieve their goal of denuclearization. And what, in fact, is needed is a comprehensive agreement that includes resolving the Korean war, which includes addressing the security concerns of both sides, especially of North Korea. Why are they pursuing their nuclear weapons program? Does it have anything to do with the regular annual military exercises that the US and South Korea conduct that simulate an invasion, a rehearsal for decapitation strikes? We thought this would be an opportunity to reach out to the foreign ministers. The reality is is the US is very powerful, and even though I think there is growing concern among the world leaders about the way that the Trump administration is basically destroying the planet and destroying anything decent about this world, that the government still wields incredible economic, political and military power. And so, it was a huge disappointment. But still, I think it was an important gathering of women’s peace movements to remind ourselves the role that we have to play and that we have to be the voice of conscience, the voice of the global consensus that says nobody wants a war, another war in the Korean peninsula. We have to say that this, call out this so-called diplomatic approach. There is a split. We have the crazy hawks in the White House, the McMasters and the Mike Pompeos that are calling for this bloody-nose strategy, and then you have the so-called. the adults, the James Mattis and the Tillerson that are calling for a diplomatic approach. Well, unfortunately, their diplomatic approach isn’t really diplomacy. When you cut off communication by forcing other countries to cut off diplomatic ties with North Korea, that is not dialogue. That is not promoting understanding. The worst part is the sanctions that are being passed against North Korea. We know, from 70 years, that they have really failed to force North Korea to come to the table, to give up their nuclear weapons, but what we know now is this new round of sanctions, especially the UN Security Council ones, are not about targeting the regime or targeting their missile program. It’s about targeting civilians. I mean, it’s targeting textiles. Who works in these textiles but women workers? Targeting the import of oil, how do you expect people to cook, or heat their homes, I mean, or run their tractors? This is violence against the people of North Korea. We were there to let the foreign ministers know that this is not a diplomatic approach. You may say that sanctions is the best alternative to war. Well, there is a kind of slow war that is being waged against the North Korean people. And so, when we saw Rex Tillerson give his kind of charade presentation at this Vancouver summit where he brought up this image of the commercial airline routes that take place in one day and the number of people that are flying in the northeast Asia region who were vulnerable to a North Korean missile launch, it felt very eerie to our delegation. It was very reminiscent of the Colin Powell presentation at the UN, basically justifying the need for a US preemptive strike on Iraq because of their so-called weapons of mass destruction. We left very, I think, clear-eyed about what is kind of being prepared, and the fact that there was that mistake in Hawaii with the so-called missile launch that was heading towards Hawaii from North Korea, and then a few days later about the mistake from the NHK Media in Japan. It’s a terrifying time. On the one end, you have this exciting, hopeful ray of light emanating by the two Koreas talking but on the other hand you have these really terrifying gray stormy clouds that is coming from Washington DC. I think that we have to start pivoting towards stopping a US war on North Korea. That’s, I think, how urgent the situation is. And we have very little time because we have the Olympic truce, but after that we know that the US and South Korea will resume the military exercises. This is the moment now for the peace movement in the US and the peace movements around the world to start rising up to really push our governments to say that this is not okay. We should extend the Olympic truce for far beyond. That means, basically, the freeze for the freeze, even though we heard Rex Tillerson say in Vancouver that that was off the table. AARON MATÉ: Right. Just to explain that, so, it was only a few months ago that the North Korean regime offered to freeze nuclear activities in exchange for the US and South Korea halting these massive war games next door, which the US continues to reject. But perhaps that will change should the US be pressured to accept it. We’ll leave it there. Christine Ahn, founder and coordinator of Women Cross DMZ, organizer of The Vancouver Women’s Forum. Christine, thank you. CHRISTINE AHN: Thank you so much, Aaron. AARON MATÉ: Thank you for joining us on The Real News. Christine Ahn is the founder and international coordinator of Women Cross DMZ a global movement of women immobilizing for peace in Korea. She led 30 women peacemakers across the DMZ in 2015. She also co-founded the Korea policy institute and Korea peace network. Kim Jong Un’s New Year Address: Did the Corporate Media Miss the Point? Can Washington’s Hawks Sabotage Korea’s Peace? Does Washington Want a Korean Peace, or Colony? Koreans Want Peace, Do Liberal Pundits Want War?